Jihosoft Studio releases a new Mac version of its file recovery product, namely Jihosoft File Recovery for Mac 2.51. 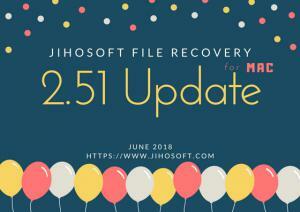 SHENZHEN, GUANGDONG, CHINA, June 28, 2018 /EINPresswire.com/ -- Shenzhen, China - June 26, 2018 – Jihosoft Studio, a leading supplier of professional data recovery and management software, releases a new Mac version of its file recovery product, namely Jihosoft File Recovery for Mac 2.51. The newly updated recovery program is greatly improved in interface design and recovery ability, along with several fresh features and functions. 1. Successful rate of file recovery keeps increasing. 2. New interface design is adopted to make it more straightforward while multifunctional. 3. Add new functions: Create image, Resume recovery, Switch preview pane between list and icons, Filter (by size). 4. Support more file types and formats, including camera RAW images: CR2, SR2, ARW, NEF, RAF, and more. Jihosoft File Recovery has a long-lasting reputation for helping users perfectly retrieve deleted files from computer hard drive, external hard drive, USB flash drive, phone microSD card, camera memory card and other storage device. The new Jihosoft File Recovery for Mac 2.51 now hits the market and will save a lot of people who are suffering the loss of important data and having access to a MacBook or iMac.